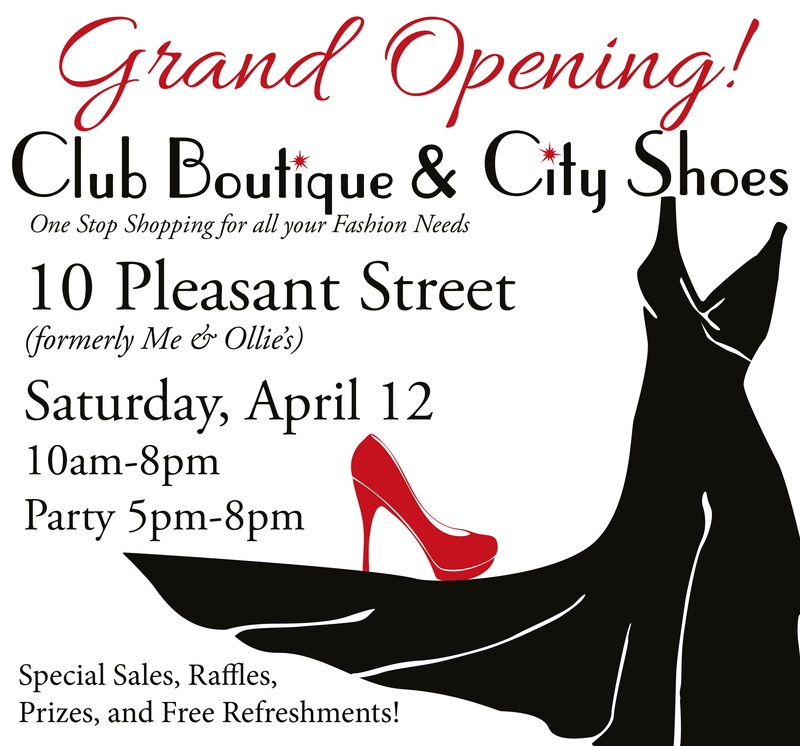 Club Boutique & City Shoes are celebrating their Grand Opening on Saturday, April 12th in downtown Portsmouth. Visitors have a chance to win some great raffle prizes, enjoy major sales and will be receiving a coupon for their next visit. Free food, music and refreshments will make this a party to remember. Stop by anytime from 10am to 8pm at 10 Pleasant St, Portsmouth, NH. Posted on April 3, 2014, in ClubBoutique&CityShoes and tagged boutique, boutique clothing, city shoes, city shoes nh, club boutique, club boutique & city shoes, club boutique & city shoes nh, club boutique and city shoes, club boutique and city shoes nh, club boutique nh, clubboutiquecityshoes.com, colorful, dresses, european footwear, fashion, fashion accessories, fashion blogger, http://clubboutiquecityshoes.com, inspiration, instacute, le club boutique, le club boutique & city shoes, le club boutique and city shoes, local boutiques, local shoe shops, model, mother of the bride, new hampshire boutiques, nh boutiques, photo of the day, photoshoot, portsmouth boutiques, portsmouth fashion, portsmouth new hampshire, portsmouth nh, portsmouth shoe shops, prom dresses, prom wear, shoe boutique, shoe fashion, shoe store, shoes, shop local, shop portsmouth, shop portsmouth nh, shopping, style, style blogger, swag, women's clothes, women's clothing, women's fashion, women's shoes. Bookmark the permalink. Leave a comment.